There have been a lot of extreme weather events that have made the news lately, especially tornadoes. When I was growing up, in both Oklahoma and Michigan, I remember going through tornado warnings and having to either bunker down under a desk or huddle in the hallway at school, once for an entire day. It certainly was an experience that stuck with me, and is one reason that I will never live in the midwest again. This kind of weather happens on a yearly cycle, and extreme weather events are predicted to get worse as our climate changes. Why is the tornado season cyclic? 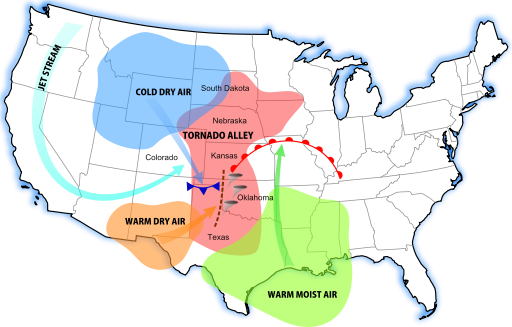 Tornadoes actually don't have a season per se, but can occur any time and anywhere. However, they are more common in the springtime when the jetstream brings together warm moist air (such as from the Gulf) and cold dry air (such as from the Arctic). When winds at higher altitudes blow in the opposite direction of the winds near the ground, rising warm air gets twisted in the opposite direction and creates a funnel. There's a little more to it than that, but that's the basic concept. You can read more about tornadoes and tornado preparedness here. the result can be a tornado. Figure from NOAA's National Severe Storms Laboratory. Tornadoes can happen any time of year. Where are you located on this map?